Well, I'm thinking of fall again. This time, it's in the form of adventures Neil and I have planned for the next couple of months - whether it's for a special Georgia wedding in October, a birthday trip to Chattanooga, or just an afternoon date spent at a plantation home close by. 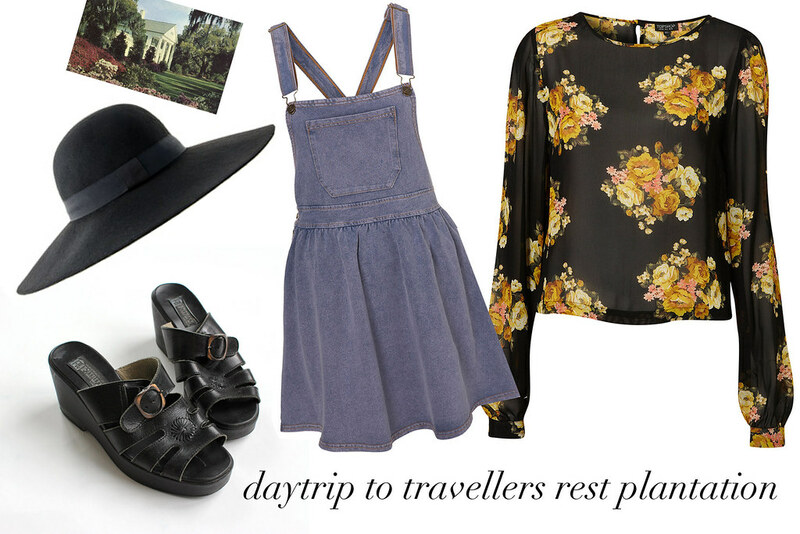 This outfit is all about a road trip I've been thinking about for awhile. I have a lot of friends who are constant thrifters, and we think the best thrift stores have yet to be found in little towns all over the south - all a short drive away in Mississippi, Alabama, and around Tennessee. I'm keeping my fingers crossed that I can coerce some of them into traveling around with me in late September on a hunt for winter finds. 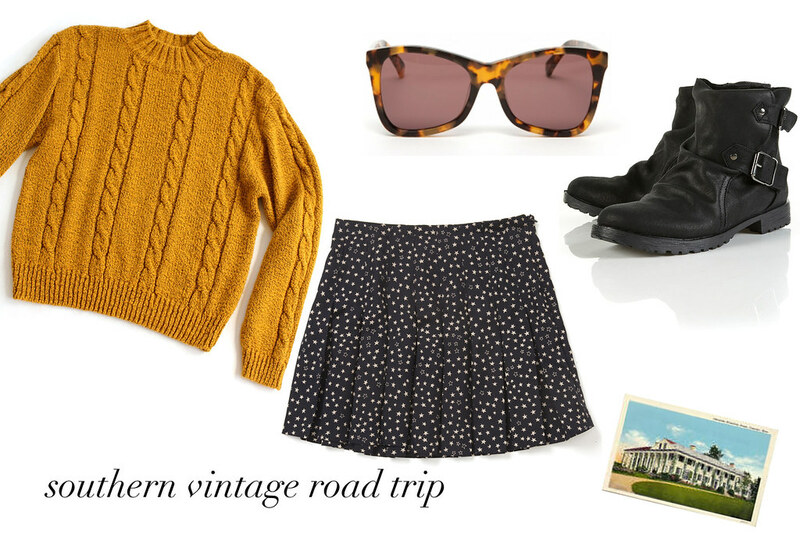 When we make the trek, I want to layer up in a thick, cozy cable knit sweater pulled over a lightweight pleated silk skirt and the grungiest biker boots I can find. In mid October, my family and I will be celebrating something I'm really excited about - my sister's wedding! 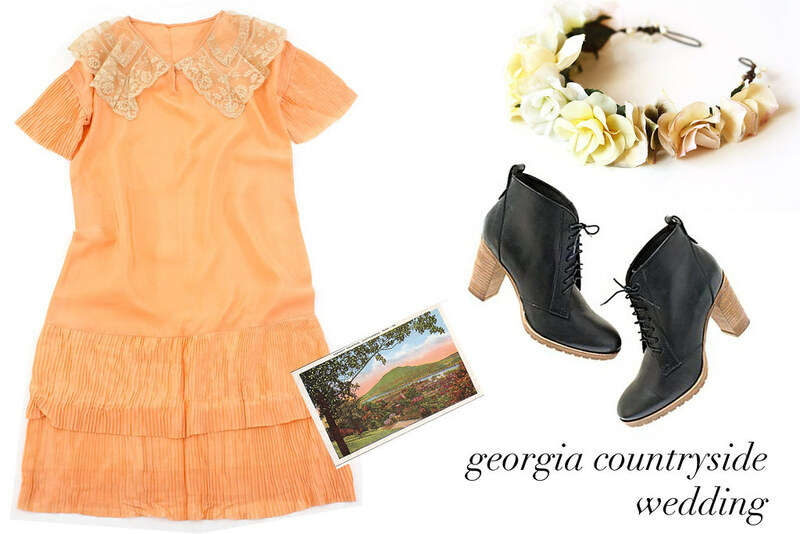 The event will take place in Georgia, nestled away in the hills somewhere, and I can't think of anything more romantic to wear than a peachy silk 1920s dress with accordion pleat ruffles and a delicate lace collar. Paired with a floral hair wreath and some wood stack heel boots in leather, and maybe a light wool cardigan? Living in Nashville for a couple of years has given us plenty of opportunities to visit its well-preserved history, but there are still a few homes we haven't been to. Travellers Rest is a plantation home and museum about 20 minutes from where we live, on the other side of Nashville. Originally built atop a Native American burial ground in 1799, Travellers Rest is a large, white-washed mansion with brick chimneys and contrasting shutters that was once home to John Overton, advisor to President Andrew Jackson and the founder of Memphis, Tennessee. I'm hoping we can make the trip sometime when Neil and I have an afternoon off. 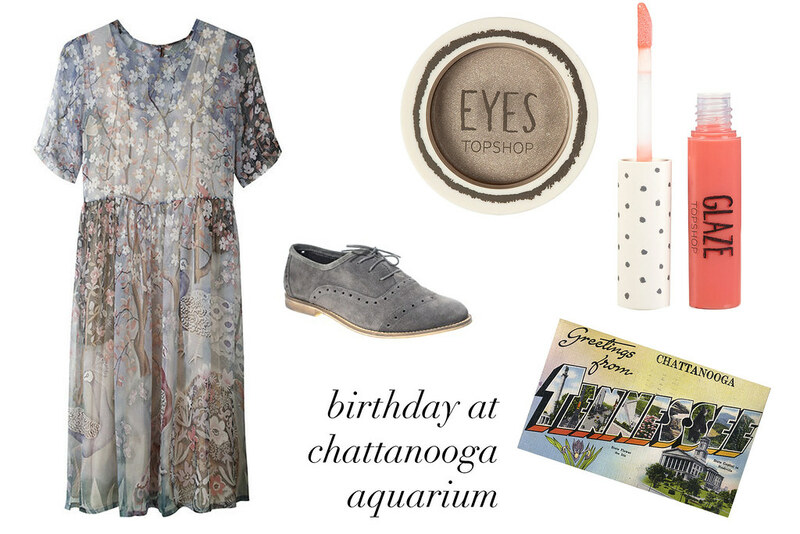 Now, wearing a Charles Anastase dress to the Tennessee Aquarium isn't something I can really do.. spending 1500 dollars on a birthday dress just isn't in my budget. But that's what makes this a wishlist, right? My birthday is next month, and we're planning a day trip to Chattanooga with some school friends who are visiting that weekend (yay!). From all of the positive things I've heard about Chattanooga (pretty riverfront, good food, awesome aquarium), I can't wait to walk around looking at fish and drink some good beer afterwards. Preferably in a romantic chiffon maxi dress and suede oxfords. To be honest, I'll probably make my birthday dress this year (like I planned to do last year until I messed up and made the mistake of not cutting the bodice pieces on the fold.. still mad about that).. maybe out of silk chiffon and maybe out of velvet, and preferably in a loose-fitting shape similar to the lula dress. Are there any particular outfits or trends you plan on trying next season?